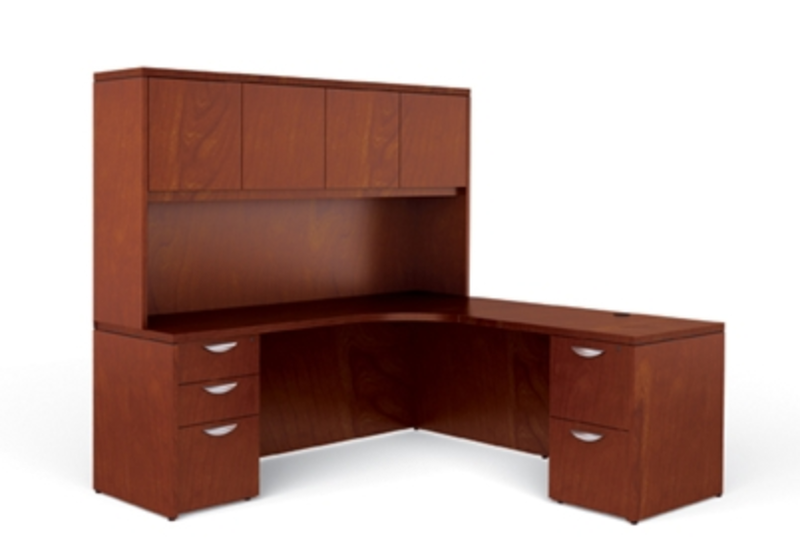 Looking for all around wood office furnishings for your workplace? Well then, it's time you met the Ventnor Collection! This incredible furniture line by Offices To Go boasts office furniture to go just about everywhere. Whether you're looking to furnish a waiting room, executive office, home workplace, or even a conference room, Ventnor has affordable wood furniture for you that won't break your bank. Here's just a few of their great products to inspire you! Just about every workplace starts from the reception area. As the place where guests, visitors, and clientele congregate and wait for extended periods of time, it's important that office waiting areas look good, and the Ventnor collection knows how to do it! This furniture line boasts great desks like the VF-F-TCH Toffee Reception Station by Offices To Go to impress guests in any capacity. This right-angle desk is spacious, welcoming, stylish, available in two stunning finishes, and it offers incredible storage. Like all Ventnor furniture, it's very affordable compared to other reception desks of similar quality. Set one at the entrance to your workplace, and it won't disappoint. 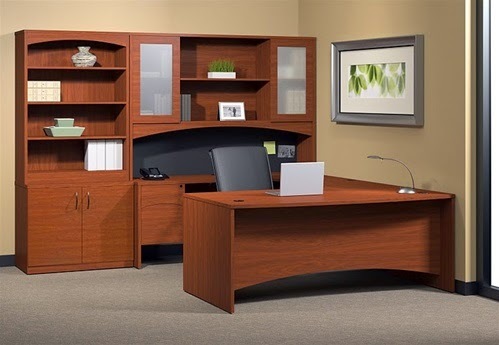 Moving on to the executive business office, shoppers will be hard pressed to find a better setup than the ones offered by the Ventnor collection. 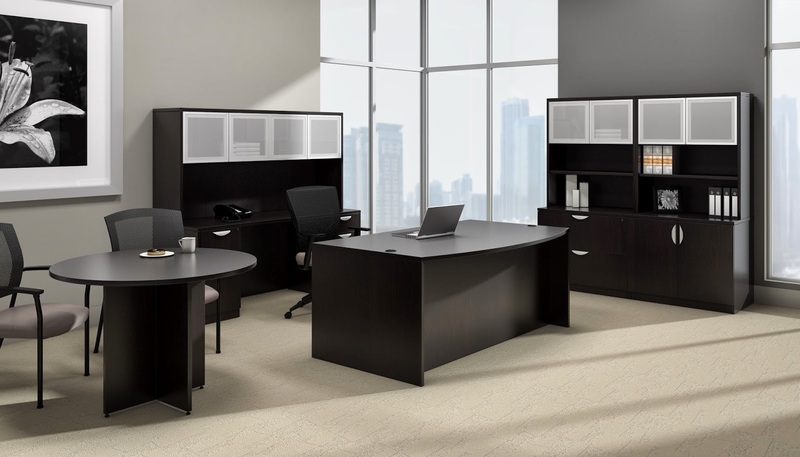 With stunning options like the Offices To Go V7 Ventnor Executive Furniture Collection, your executive office will never lack for style or impression. 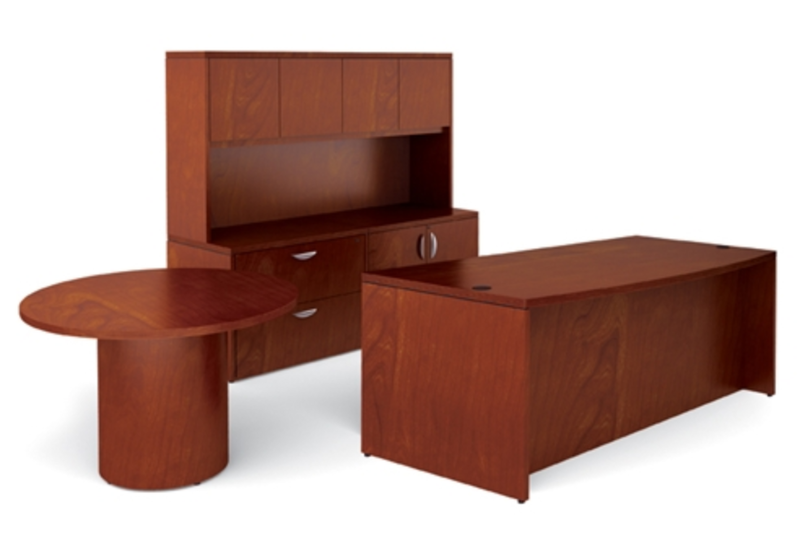 This furniture set doesn't just feature a desk, It also includes a storage cabinet with an overhead hutch, file pedestals for storage, and even a small drum base meeting table for talking with visitors. Of course, if the V7 is too much for you, don't fret. 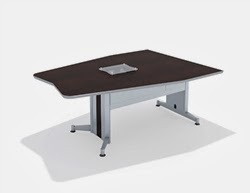 Ventnor offers an excellent selection of single desks, workstations, and meeting tables as well. Any of them would work well in an executive office. Typically, the space in a home office runs a little smaller than the square footage provided by a company in an executive workplace, but it doesn't mean the needs and tasks required are any less. For a workstation with plenty of space, plenty or storage, and plenty of contemporary appeal, few things are better than the V11 Ventnor Modular Desk Confuguration by Offices To Go for a home workspace. Because of it's convenient modular design, the V11 is a perfect choice for a home office. The design keeps everything at arm's-reach, so it's there when the user needs it. In addition to the V11, Ventnor also offers plenty of other acceptable home office desks and workstations, all in varied sizes and price ranges to suit individual needs! One of the best things about the Ventnor collection is that it doesn't just stop at desks; it includes so much more. Instead of leaving the rest of the office bare, Ventnor also provides plenty of conference tables and furniture to unify the whole workspace. The Ventnor collection offers conference tables in plenty of shapes and sizes for various offices, but the grand-daddy of all of these is the conference set. Why shop forever looking for everything you will need rather than getting it all in one go? Well, it just so happens that's the philosophy behind the Offices To Go V13 Ventnor Conference Room Furniture Configuration, and with all that's included, you'll never want to pass it up. The V13 is the perfect conference room setup. Everything needed is included, including a conference table, two bookcases for incredible storage, a credenza with locking pedestals, and even a presentation board! 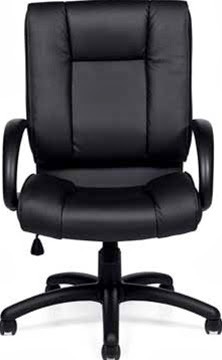 All users need to do is seek out some affordable leather conference chairs for sale and set up shop! And last but not least, we leave you with Ventnor's incredible accent furniture! If you've got all the office essentials, it's time to round it out with the last finishing touches, and the Ventnor Collection by Offices To Go knows what you need. Whether you work in an executive office, home, conference room, or waiting room, it never hurts to have a bit of extra storage. 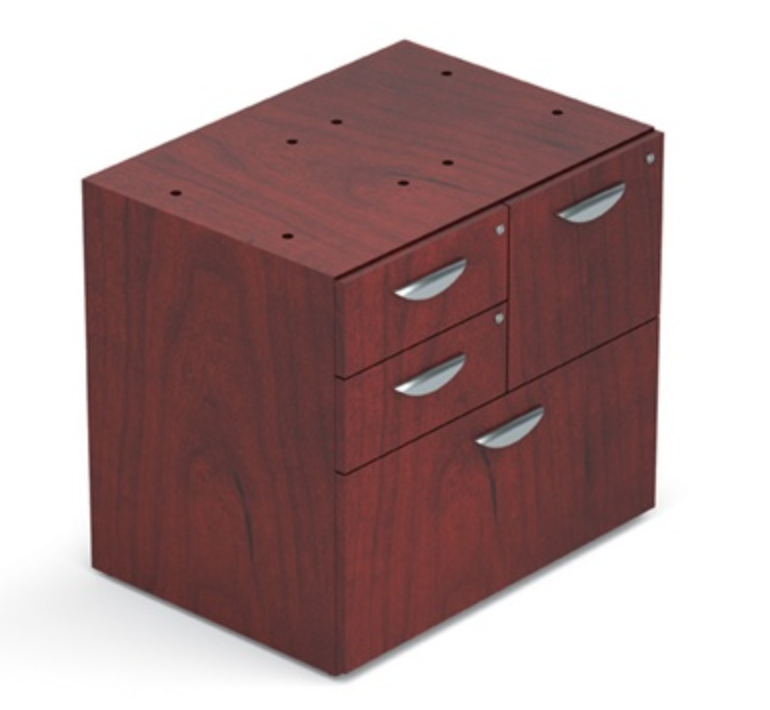 Ventnor's accent furniture includes great storage features. Cabinets, file drawers, storage pedestals, and even the clever Offices To Go VF3022MSF Mixed Storage Unit to blend them all are the supplements to the Ventnor line. Not only are they as affordable as everything else, but in offices prone to clutter or disorganization, they're worth their weight in gold! Executives work hard to keep companies up and running, but like any machine, they need to have all the right parts. Like their employees, executives need several tools to function. Of course, most have the absolute necessities like a computer, a desk, and a chair, but how do you know if you have the right kind? The modern age has brought with it tons of advancements in traditional office equipment as well as new innovations to improve work experience and increase productivity. Here's the top seven essentials to get you started! 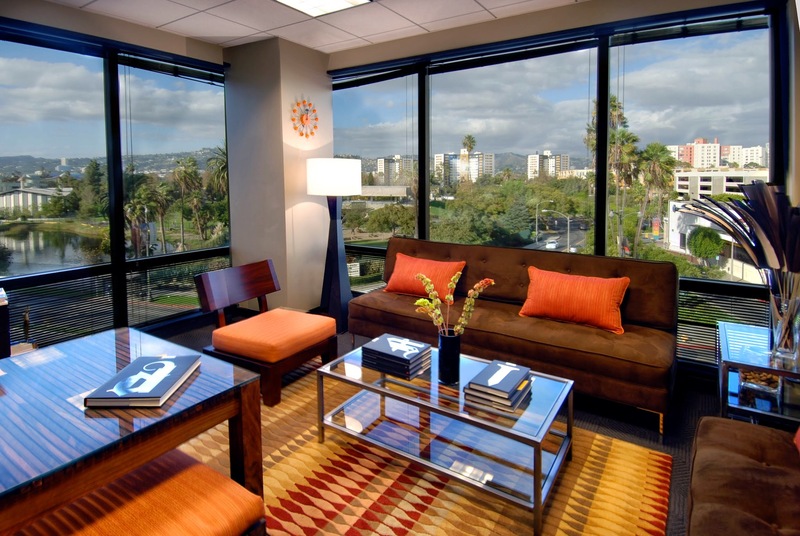 Every executive needs a place to work that exemplifies the purpose of their business. Most executives opt for the classic professional look, but it never hurts to toss in a bit of modern style. 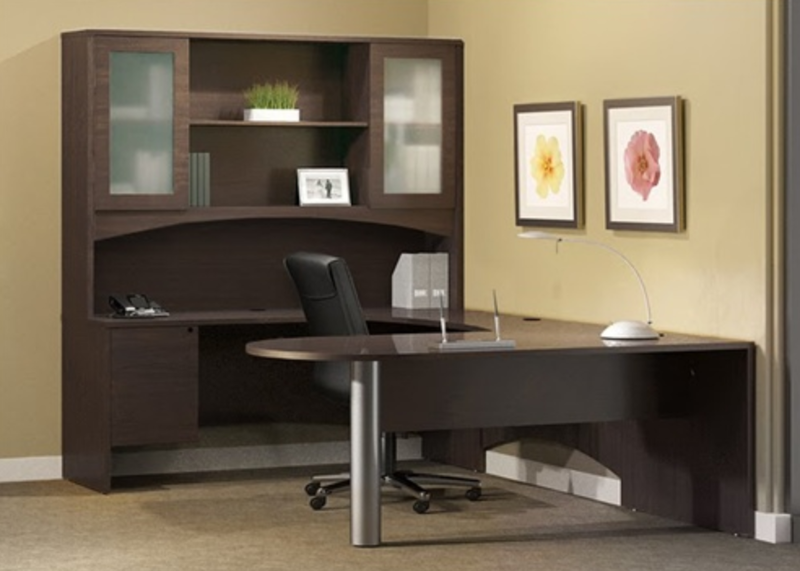 Choosing wood office desks for executive use is the perfect way to achieve this balance. Typically, they showcase the classic wood finished style executives have come to love, but they also boast chrome accents and sweeping curves to hint at the modern. 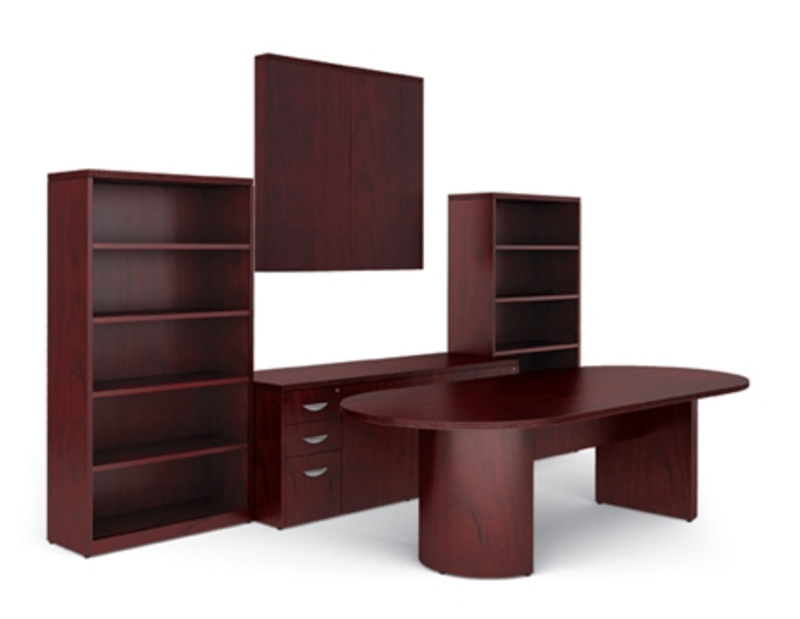 For work purposes, be sure to look for executive desks that have modular design and plenty of storage. Their efficient design helps to increase productivity! There's a lot of perks to being an executive, but one of the best has got to be the big comfy chair! Ergonomic design has turned workplaces all over the nation into living organisms of efficiency and comfort, and nowhere is that comfort more enjoyable than in the executive office. Much like ergonomic task chairs were created to improve the work experience of employees and computer users, executive office chairs with ergonomic design were created for executives in the same way. Ergonomic executive chairs come in a wide array of designs, from the classic plush black leather look, to the modern mesh back chair. Keyboard trays are beneficial for anyone that works on a computer, whether all day or even just a few times a day. 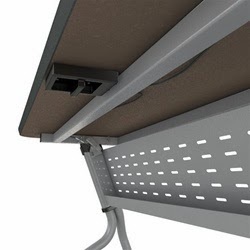 By mounting underneath the office desk, they remain at arm's level so user's don't have to strain their arms upward to reach over the top of their desk to type. When user's keep their elbows at right angles to their bodies and their wrists and hands parallel to their forearms when typing, it allows the blood flow between these joints to remain at optimum levels. By doing this, ergonomic keyboard trays for computer use greatly reduce the risk of users developing joint pain, arthritis, poor circulation, or carpal tunnel syndrome overtime. Best of all, they're a great value! Wish you had a bit more workspace for your computer? Well, there's no better way to get it than through a dual screen monitor arm. Serious gamers have long made use of dual screens to improve their gaming experience, and not executives and business owners all over the nation are finally hipping up to this improvement on work style. Now, you may be thinking that the space taken up by multiple computer screens at an office desk would render them impractical. However, computer monitor arms improve office efficiency by keeping the screens off of the desk, effectively increasing work space! 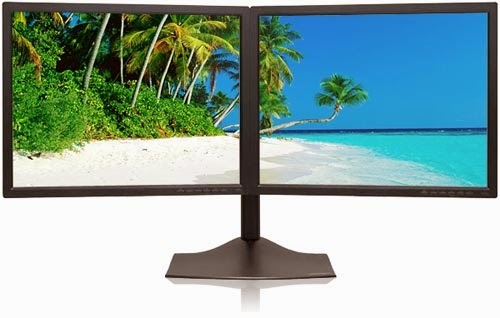 Monitor arms can support one screen or eight depending on the one you buy, and most offer adjustability features for convenience. Just mount one to a desk or wall and you can surf the web with the best of 'em! 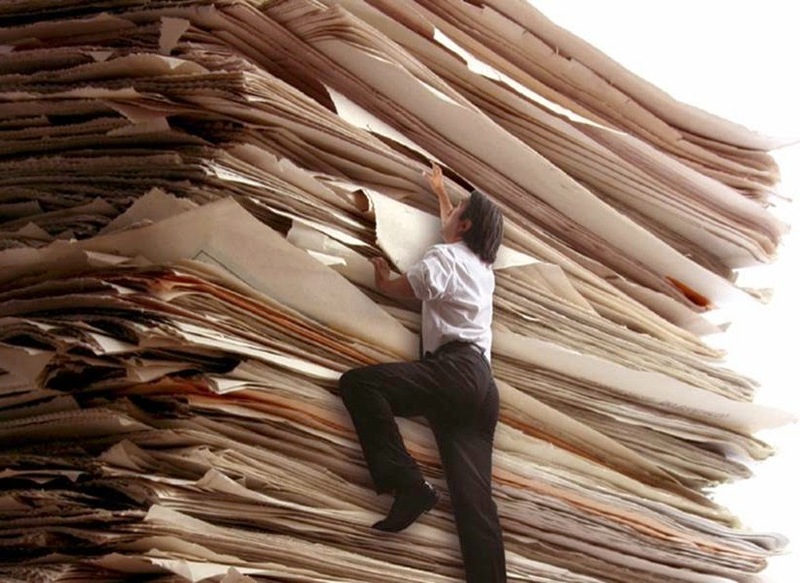 Even though files have become something we largely associate with computers nowadays, most businesses still keep traditional paper files around in some capacity, but they can be a big mess with no place to put them all. In executive offices that depend on style and professionalism to make an impact on guests, clutter definitely takes away from the effect. Adding storage devices in the form of wood cabinets, bookcases, or vertical file cabinets for office storage can become an appealing way to clean up a space while simultaneously protecting your clients' files and information. Speaking of protecting information, there's no better way to ensure it than through a paper shredder. 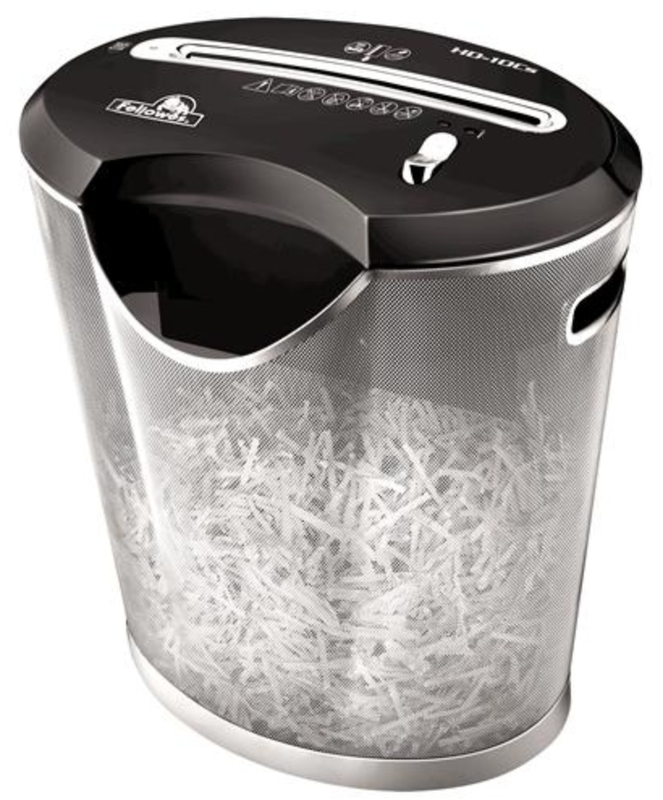 With all the confidential paperwork executives have to deal with on a daily basis, keeping discount paper shredders for office use around is a great convenience. For around a hundred dollars, executives can have this convenient piece of equipment to destroy old information or records so that they don't wind up in the wrong hands. They're useful, compact, and they usually last a number of years! And finally, we leave you with an oldie but a goodie. 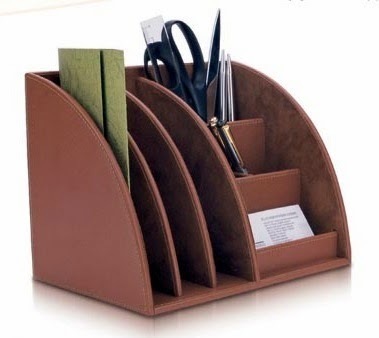 Desktop organizers have long been a part of the office experience, and they aren't likely to leave any time soon. As much as we rely on computers, paper is still an essential part of office life, which is fine, as long as it doesn't make a mess. Unfortunately, paper certainly has the reputation for doing so. The good thing about desktop organizers is that they're super inexpensive, durable, space-saving, and very convenient. If you get a lot of notes and letters throughout your work week, a discount desktop organizer may be just the thing you need to reign it all in. With all of the fancy modern office chairs on the market in 2014, it's nice to see that some manufacturers still take pride in producing heavy duty seating solutions. While the TruForm chair series by Global lacks nothing in terms of style, these high quality office chairs are also built to last and withstand the rigors of any work day. In today's article we'll be reviewing the popular models from the TruForm line. Prepare to be impressed! The Global TruForm Chair series is a line that offers value, comfort, and a choice of mechanism designed to suit any workplace application. These customizable chairs offer unmatched versatility and superior ergonomic features for improved efficiency and productivity. TruForm chairs combine streamlined seat and back cushions with simple curves for a simple yet sophisticated look. Both armless and adjustable arm TruForm chair models are available to meet your specific needs. All models are standard with a 3" wide back upright for added strength. 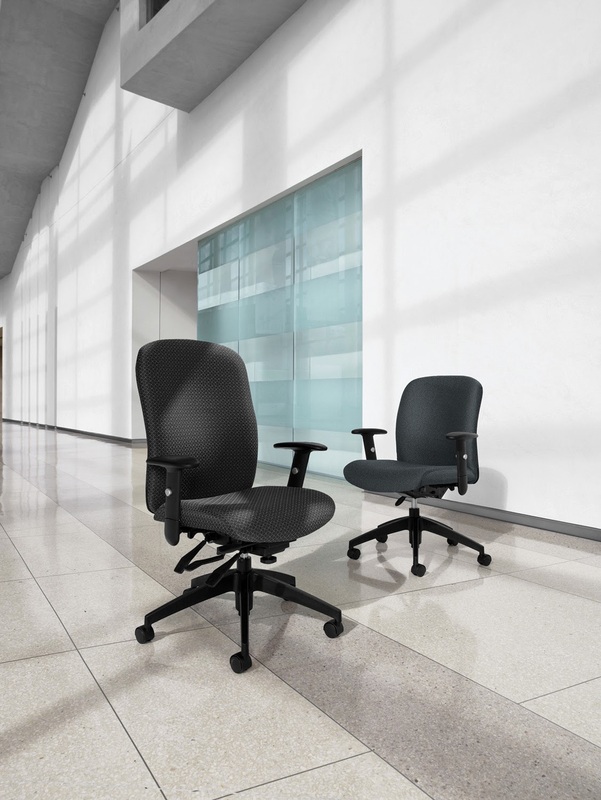 The TruForm operator models offer independently adjustable seat and back height functionality. These user friendly chairs can be locked into any position via a free floating mechanism. Tasking models come standard with a fixed back design, seat depth adjustment, and seat height adjustment capabilities. 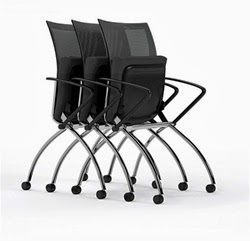 Heavy Duty TruForm chairs are built for 24/7 work environments and offer too many adjustment capabilities to list. Needles to say, this collection of professional ergonomic seating for office use is ready to meet any demand. Still need more to convince you of the excellence this line has to offer? No problem! Global has gone above and beyond by adding drafting models for art and architectural needs. This entire line is GREENGUARD Certified and ready to service your workplace needs in an eco friendly fashion. TruForm seating starts at $379.99 for the TS5451-3 model and will comfortably accommodate users up to 350 lbs. Yep, you heard it right! These awesome chairs are also engineered for professional big and tall office seating needs. At the end of our review process we were left wondering if there was anything this line of chairs couldn't do. Our overall grade of A+ was a must. With an excellent design, extensive selection of fabric and leather options, and heavy duty construction this high end chair line offers affordability and long lasting benefits any user will surely appreciate. It's no secret that office chairs can get expensive, but who says you can't cheat a little bit? Saving money isn't a crime, and there's tons of ways to get more bang for your buck. With a little resourcefulness and an open mind, shoppers can save a bundle on great items like brand new office chairs by remembering these nifty money saving tips! Enjoy! The name alone is music to the ears of almost every thrifty personality on the planet, and with good reason. Those that are willing to call up a few furniture dealers will undoubtedly reap the benefits of curiosity. Buying high end executive chairs with leather upholsteries and tons of guest chairs for a waiting room can put shoppers on the fast track to an empty wallet. Fortunately, anyone buying more than two products usually qualifies for bulk savings. Dealers are all about sales and customer satisfaction, so contacting them with queries about potential discounts gives them the opportunity to gain both. Even if you're only after one specific chair, it never hurts to call for a discount. Hey, they're called "dealers" for a reason! Coupons aren't just for groceries. They're excellent ways to save on all kinds of things if you take the opportunity to look for them! With paper largely on it's way out the door, most online furniture dealers are posting their coupons online. Flash sales are often showcased in blog posts or on the dealer's website with coupons and money-saving codes for potential shoppers to enter in at checkout, but that's the hard way around. Today, there are tons of super simple ways to save through coupons. 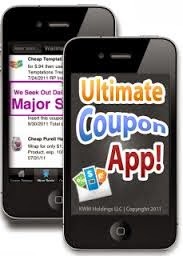 Sites like Tjoos.com and RetailMeNot.com offer coupons from most of the best chair providers. Free apps are also a great way to save on discount desk chairs with modern style. Having to pay for shipping is a pain. You search for hours and think you've finally found the best deal on an expensive office chair, and then when you get to the end of checkout they tell you there's huge upcharge for delivery. However, there are plenty of dealers out there with honest pricing. When websites advertise that there's no shipping charge, it means there's no surprise money-grabbing in the end. 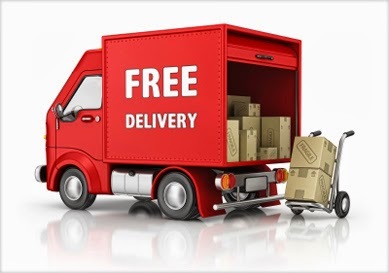 If you're shopping for adjustable task chairs for home and business use, take the time to search out a site that offers free shipping. It won't take long and the money saved can be substantial. Comparison shopping engines are the shopper's dream come true. They are sites that search from all over the web for the lowest price on an item, nearly always saving users tons of money. Google Shopping, Amazon, PriceGrabber.com, and BizRate are some of the most popular shopping engines, but there's probably a million out there. Choosing modern office chairs for computer use can be difficult, and expensive, but with the ability to search by product, brand, or price, any of these engines has the potential to save you a bundle. There's even apps available! Just type in what you're looking for to save yourself from looking! For regular shoppers of any brand or dealer, it never hurts to sign up for newsletters! Most dealers are hipping up to the fact that daily emails are a no-go (and they're super annoying). Weekly and monthly emails are definitely more manageable for most, and they're becoming much more common. Some dealers even allow their customers to choose how often notifications come! Newsletters provide great ways to see what sorts of sales are going on with your favorite brands! Many of them often have coupon codes, clearance lists, new additions, and discount products listed that can save you tons. On things like high end ergonomic chairs for executive use, it's well worth your time. And lastly, don't be afraid of the dealer. Furniture dealers usually have a much better idea of when products will be upped in price or discontinued. 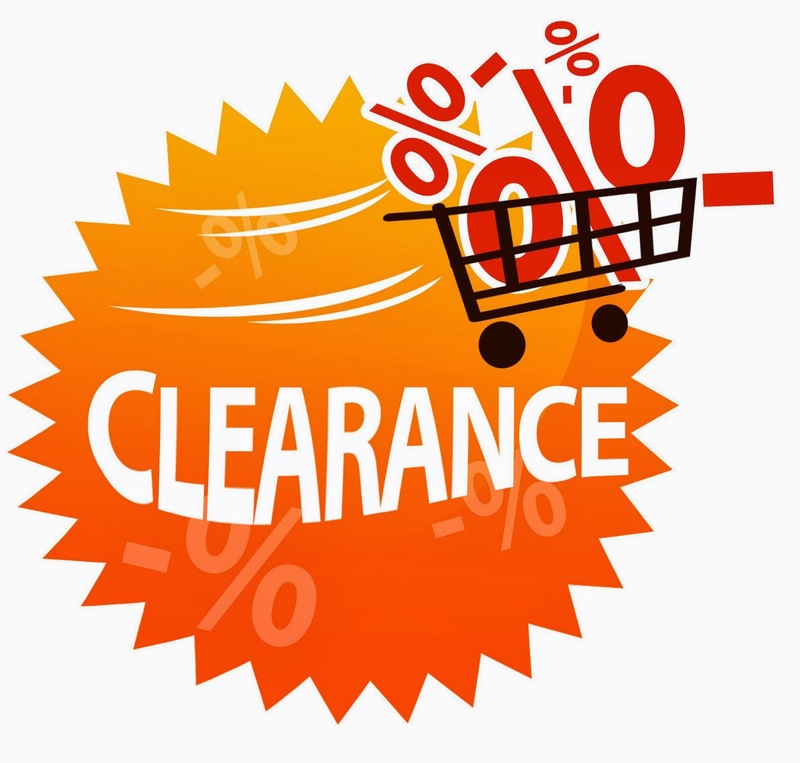 If you don't have a particular chair in mind, calling ahead to ask about clearance and closeout specials could get you a chair for much less than it was originally priced at. If you're okay with using a slightly out of date model or are in search of a vintage style, there's no better way to get what you need and still keep your wallet happy. There are tons of classic leather chairs for conference use out there. Why not see if you can nab one for a discount price? When designing a professional office space, businesses are commonly faced with tight deadlines and strict budgets. In today's article we'll highlight the helpful tips and industry secrets you'll need to get your project finished on time and stress free! From the lobby to the boardroom, these versatile tricks will improve your business makeover efficiency. All too often businesses go into office design projects without a distinct plan of attack. To better tackle your makeover, create a list of pieces you need and goals you hope to accomplish with your project. As budget is always a factor, assessing your needs at the beginning of your project will help to prevent you from splurging and exhausting your funds too quickly. The tips below are sure to help you create an itemized plan of attack for your project. Once you've determined your specific project needs, it's time to shop. By now you should have met with an industry specialist to receive product suggestions on what brands, collections, and styles will work best for your project based on the tip list highlighted above. Take your new found knowledge to the digital world and search your favorite engine for deals, specials, and companies offering free shipping office furniture promotions to maximize your budget. Be sure to inquire about specific product lead times with your dealer of choice and leave up to 1 week of cushion for any unforeseen manufacturing issues that may occur. Now that you've comparison shopped and purchased the necessary furniture to complete your project, the next essential step is to schedule delivery. There's not much worse than having a delivery driver show up when you are in no way ready to receive your new furniture. Scheduling delivery is a sure fire way to help you stay organized and on top of your makeover deadline. 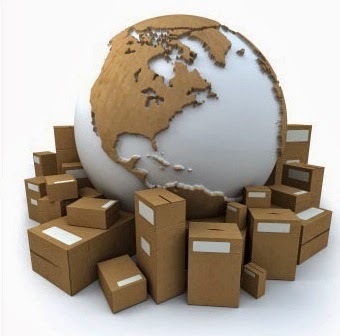 To determine an estimated delivery date effectively inquire with your dealer about a shipping date. Once items ship a tracking number will be available upon request. Obtain this number and the freight carriers information and call them asap. The sooner you request a specific delivery day the more likely the carrier will be able to meet your request. Whether you choose to go the way of a professional office furniture installation service or opt for self installation methods with your team, prepping your space is an absolute must. Start by removing old office desks, tables, and seating a few days in advance. Be sure to take pictures of the furniture in your current space if you're planning to sell it to recapture expenses. With your old furniture removed you'll be empowered with a clear canvas to begin your makeover. Take the time to create a staging area for new furniture to be placed out of the way. This simple tip will save you time and prevent the need to move boxes multiple times before they are actually needed! Having the correct tools on hand to install your furniture will prevent time consuming trips to the hardware store. If you're hoping to meet a project deadline, these little hiccups will surely hurt your chances of doing so. The tool check list below is a helpful guide as to what items you'll need on hand to ensure a smooth and effective install. Once the installation process is completed, rest assured there will be debris! Packaging materials like bubble wrap and card board will be abundant. For larger projects like conference room, executive offices, and office lobby furniture configurations, be sure to have an empty dumpster on hand to hold all your unwanted waste. Breaking boxes down will save space while trash bags will come in handy for smaller odds and ends. Often, new furniture will be accompanied by dust. Therefore, having a soft rag and cleaning supplies will allow you to make your new products shine to their full potential before the following work day. Overall, meeting your project deadline is all about being prepared and organized. Collaborating with your coworkers and furniture provider will provide helpful insight all throughout the process. Be sure to generate an itemized plan and budget to follow for your specific requirements. In the long run, the makeover transition when handled right can be a truly fun and rewarding process you can be proud of! 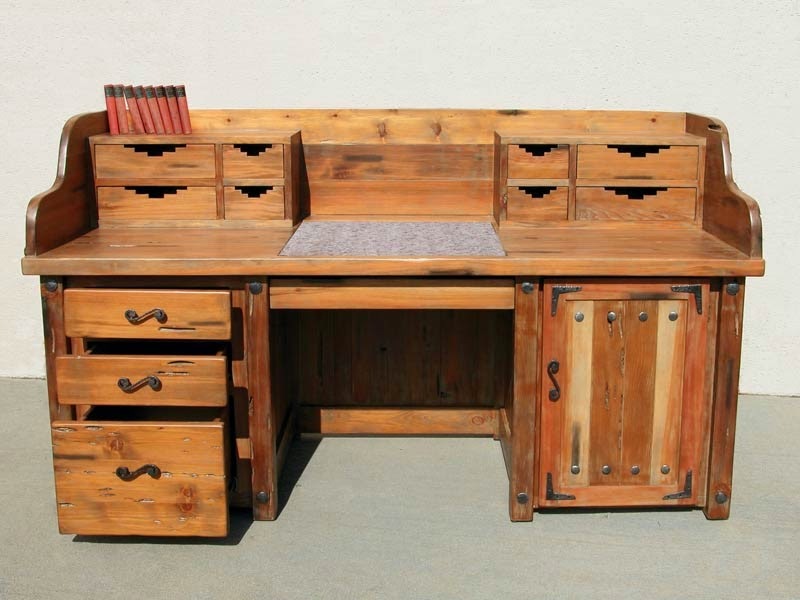 It's hard to find a good executive desk for an affordable price, but if you look hard enough, it's definitely possible. Lucky for you, your search is over! Forget all the used furniture stores and online seller sites. Here, all the desks featured are brand new with plenty of executive appeal to turn your workplace into a professional establishment. The best part? Every desk is under $1500! To start off our list of popular affordable executive desks, we present the SL-B-AEL U Shaped Espresso Desk Layout by Offices To Go for your workplace. Perfect for both home and business environments, this U-Shaped desk offers modular design to ease the burden on users. The unique design keeps everything at arm's reach, and also provides plenty of storage space for essentials. 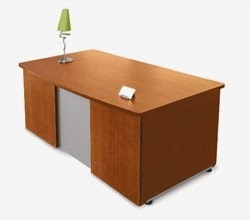 The desk set features an overhead hutch with doors and two file pedestals. At just $1127.99, no wonder it's so popular! Speaking of popular, it's time to let the cat out of the bag on the SK22 Stella Toffee Finished Veneer Executive Desk by Mayline to save you money. Got a small home or office workspace? No problem! The Stella desk almost always fits. Perfect for a home or business executive office, this desk offers tabletop space, shelving, and storage all in one compact design. 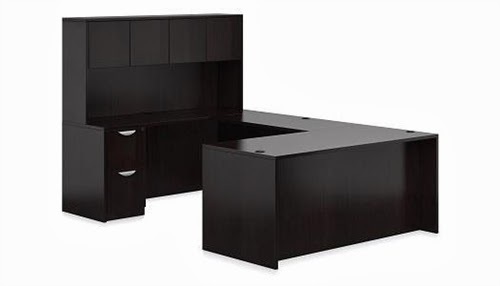 The desk isn't too big to fit in small spaces, and it isn't to small to lose it's professional executive look. This particular desk is available in a beautiful toffee finish and crafted out of Grade-AA birch hardwood veneer. It boasts a credenza, a hutch, and two box file pedestals for the affordable price of $1,011.99. Want something with a "glassy" appeal? Then say hello to the Calico Designs OL1Glass Computer Furniture Set for your office. This unique set steals the show at just $927.99. In addition to the stunning desk, users also get two stacking bookcases, a TV stand, a corner connector, and a keyboard shelf! The glass accents make this table perfect for modern executive offices, and small spaces in particular, as the glass is less obstructive to view than wood or metal furniture. 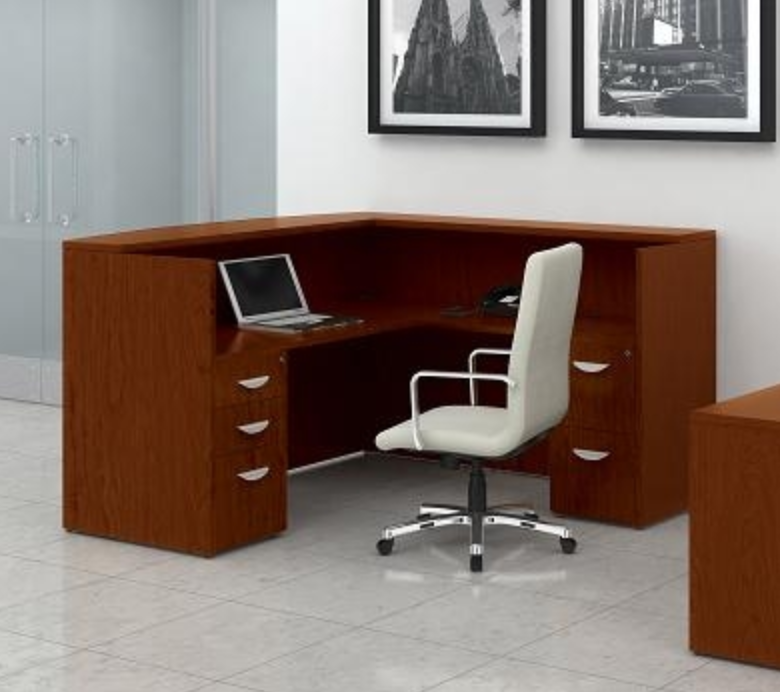 The brown wood frame brings in just the right touch of classic executive style to make this furniture set the perfect addition to any professional workspace, either at home or in a commercial office. Packed to the gills with contemporary style, it's hard to find anything more modern than the OFM 55145-CHERRY Venice Executive Desk for your office. This desk goes wonderfully with almost all current decor. It comes in either a rich cherry or dark walnut finish for versatility. Furthermore, the head-turning design allows this desk to double as a reception desk to greet guests. It is one of the more wood executive desks for sale out today, and at just $718.99, it's also the most affordable on our list. Coming from what is perhaps the most respected office desk manufacturer, and their most affordable furniture line, we are proud to present the Mayline BT23 Brighton Executive Office Typical for your office. This isn't just the desk, it's the whole package. Complete with a credenza, peninsula table, hutch, bridge, and suspended pedestal, it's a steal at just $1,091.99. Available in either a beautiful cherry or mocha finish, it boasts plenty of charm while the chrome accents give a nice tip of the hat to the modern era. 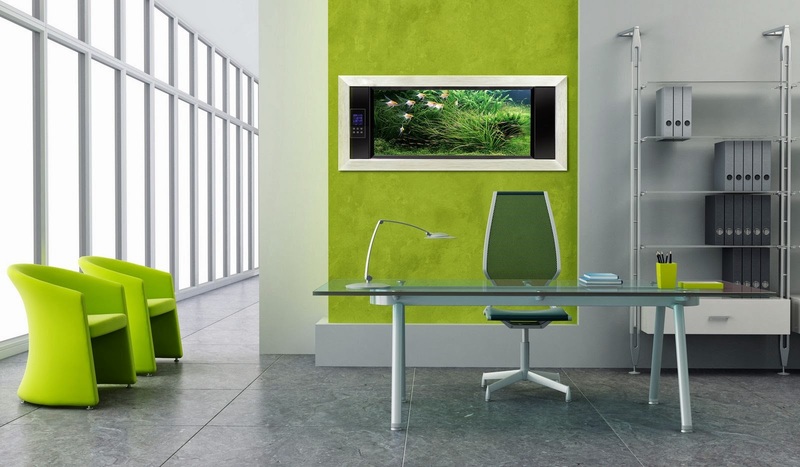 It makes a gorgeous addition to any executive office for both home and business applications. A lot has changed in the past few years with regards to office lifestyle. Ergonomic studies are always happening, policies are always being implemented, so the workplace is ever changing all the time. It's important to stay up to date on any ideas that could potentially impact your workplace, but how do you know when it's time to redo everything? Well, for starters, asking yourself these questions and then taking the necessary steps to improve your office is a great place to start! 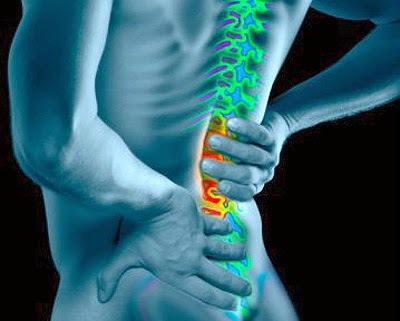 Are You Dealing With Back Pain At Work? While this isn't exactly the newest problem on the list, it still remains one of the most common. Back pain and muscle aches at work can take a huge toll on business. Employees in pain have reduced overall health, impaired activity, reduced productivity and efficiency, and often, a sour mood. If you or your employees are still suffering from back pain, perhaps it's time for an office makeover. 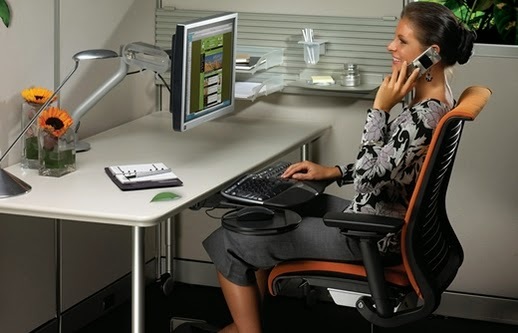 There have been some truly astounding advances in the field of ergonomic study, and adding affordable ergonomic office chairs for computer users is the perfect way to chase the pain away. Almost all ergonomic office chairs are designed first and foremost to alleviate back pain as it's the most common office ailment. 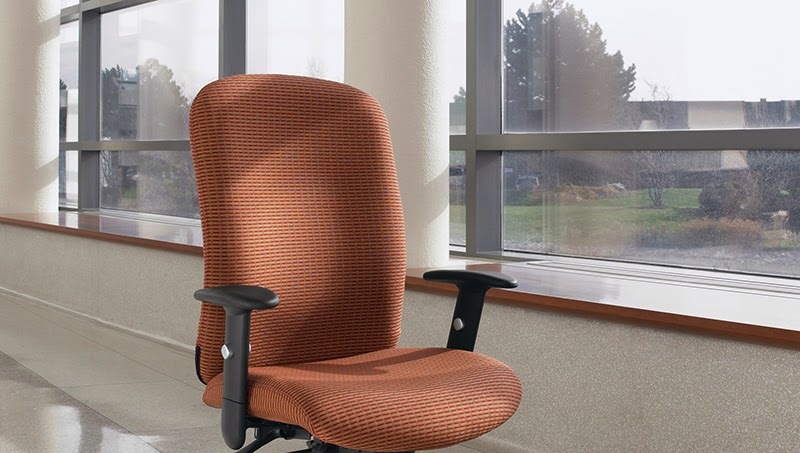 However, a new ergonomic chair may bring a host of bonus benefits like comfortable seating, reduced joint pain, better circulation, and a super affordable solution to many office problems! It's never a bad idea to examine behavior on this one before heading off to the furniture store. Cluttered offices can be just as much as result of habit as of not having the right storage space. However, if the latter is your problem, it might be time for an office makeover. 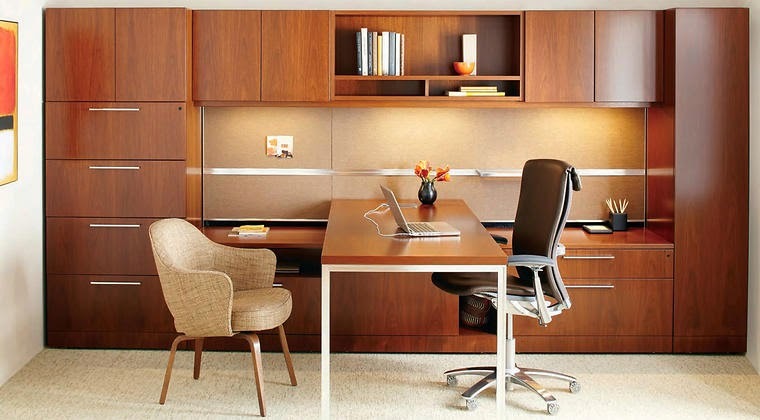 Storage space is the key to maintaining an organized office environment. Even adding a few bookcases or small office cabinets for storage can have a huge impact on the efficiency and productivity of an office when everything is in it's place. In addition, making sure everyone takes a minute to wipe down their work area with disinfectant at the end of the day can drastically reduce the spread of germs. Combined, all of these things work together to produce a clean, healthy environment for employees and guests. Probably lemon-scented too! How Old Is Your Current Desk? The best part about switching an office desk is that it really only needs to be done every five to seven years. That leaves plenty of time for functional use and loads of time to regain your money's worth if you purchased brand new. However, as cool as a desk from the stone age may be, if you're using one, it may be time for an office makeover. The biggest hindrance to most people's buying office desks is definitely the price, and while desks can get expensive, we're here to tell you it's likely not as pocket gouging as you may think. There are plenty of discount modern computer desks for sale out there at reasonable prices if you're brave enough to look for them. 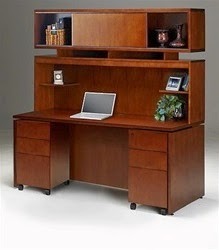 Many computer desks by Flash Furniture and similar brands are some of the most affordable options you'll find anywhere. If you're straining to get work done at a desk that hasn't been upgraded since the '40s, it never hurts to save up in case you see a desk you like. Is Your Furniture Layout Functional? This problem may be a bit harder to recognize and solve than the others, but you've come to the right place! You may have the best guest furniture on the planet, but an inefficient layout can deeply hamper effectiveness and efficiency in the office. If this sounds like you, it's definitely time for an office makeover (or at least, some rearranging). 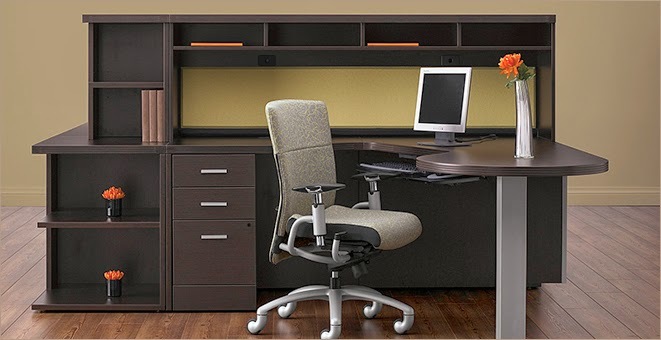 In the work area, ergonomic workstations with modular design can have a huge impact on the way an office functions. Modular ergonomic design focuses on keeping everything at arm's reach for the user, so it limits the need to travel around the office for essentials, improving productivity and efficiency drastically. In the guest area, layout has a big impact on the way the business is perceived. Organizing the chairs in groups around a the room's perimeter or around stylish coffee tables for office use is both the most common and the most efficient layout. Just make sure the chairs don't block view of the entryway or the receptionist as it sets a bad impression. Does Your Office Decor Match Your Style? Without a doubt the most fun question on our list for obvious reasons. If your decor doesn't match the theme of your office, it's definitely time for a makeover. It makes sense. It's hard to set an example of adult professionalism when white collar business executives are having to squeeze in colorful pediatric chairs designed for kids. If you want your business to exude polished modern style, bright primary colors and flashy plastic stars hanging from the ceiling probably isn't the way to go. When making over your office, decide the nature of your business and decorate from there. If you're aiming to impress executives, chrome, glass, and dark wood furniture with neutral or gray tones is an excellent decor style. If your main goal is to promote the business as much as possible, going with company colors is a great idea, as long as they don't clash too much. Never be afraid to try a new look, but seek the advice of interior designers and decorating professionals before implementing it, and always aim for a memorable look that shows the individuality of your business! Offices To Go is poised for major success in 2014. While we all know OTG chairs offer excellent ergonomic features at a price any budget will appreciate, it's time to start considering this already popular manufacturer one of the industries elite when it comes to furniture. 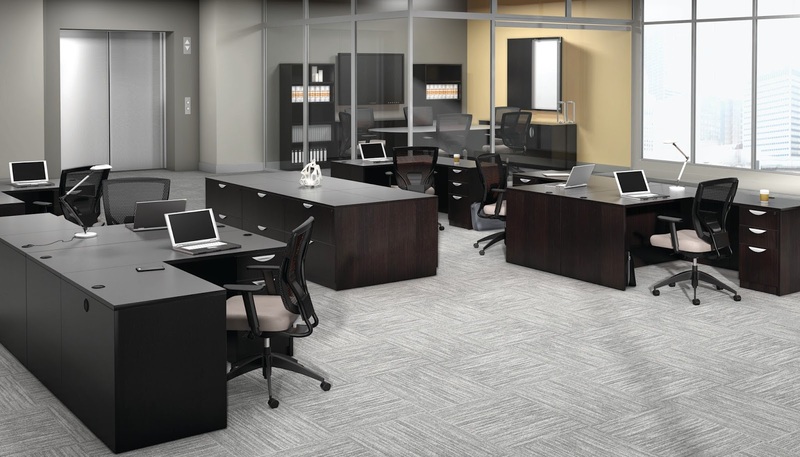 The Offices To Go superior laminate desking line has been recently expanded with a hot new American Espresso finish that takes this collection over the top. In today's article we'll show just how impressive Offices To Go's new furniture is and how they are rapidly becoming an industry standard for desking as well as seating! The Superior Laminate Desking Collection by OTG has been around for some time now. While this line has enjoyed modest success, the addition of the new American Espresso finish option is sure to sky rocket this revamped collection's popularity. With a full line of desk layouts for executives as well as reception stations and conference room tables, Offices To Go has boosted their ability to appeal to corporate design teams everywhere. At first glance you'll notice the unique modern design qualities and stylish handle pulls on the Espresso Desks and storage components. Upon closer inspection features like the metal pins and cam fasteners are sure to make the installation process a breeze. Metal brackets are also included and provide additional strength and long term durability. The box and file drawers feature full extension ball bearing drawer slides for smooth operating and improved functionality. The matching lateral files come equipped with a mechanical safety lock that's sure to keep your important documents safe. The extensive lineup of interchangeable components makes creating team work environments and custom executive office furniture layouts incredibly simple. Those looking for the ultimate in user friendly design will love the 20 pre configured desk and conference room furniture packages OTG has put together to make your shopping process a cinch. Overall, the new Espresso desks from OTG deserve an A+. While this line has been under rated for years, the addition of this trendy new finish is sure to earn this collection the credit it truly deserves. If you're in search of a full service collection designed to meet the needs of any office area, choose the Offices To Go Superior Laminate Desking Collection and save a bundle on your makeover project. Like their inhabitants, executive offices should always dress to impress. Keeping a nice, neat, organized space that exudes plenty of high end style can seem like a bit of a challenge, but it's definitely necessary to win the respect of potential clients and business partners. For anyone looking to do an executive office makeover or decor project, you're in luck. Today's post highlights all the latest styling trends for executive offices. Enjoy! To start things off easy, our first task is definitely the simplest one. Natural lighting can have profoundly beneficial effects on human psychological health. There are numerous studies showing the links between natural lighting and better mood, better outlook, better focus, and even better energy. 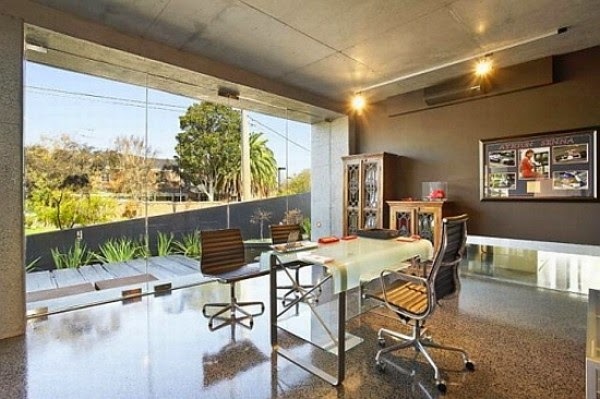 Show off your executive appeal by opening the blinds and letting the sun shine in! It gives the office a much more upbeat feel that can benefit both you and your guests! 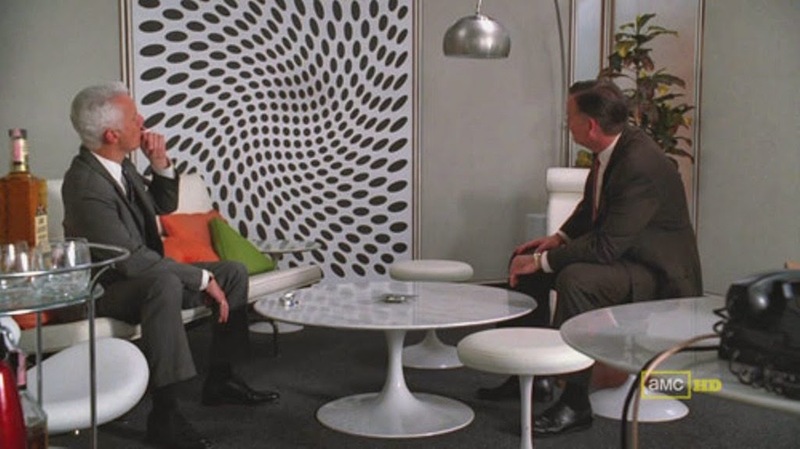 Boring walls make a boring office, and that's not impressive at all. To really wow your guests, don't be afraid of a little color. White and gray can even work well as long as you've got interior design sense. Decide on a color you think you would like that most furniture could easily match, or if you've already got some furniture picked out, choose a color scheme to match it. Study up on the color wheel and get some advice from an interior designer before painting. Remember, when picking paint, always go a few shades lighter than the color you'd like. The shadows in a room will make everything look darker than it actually is when all is said and done. 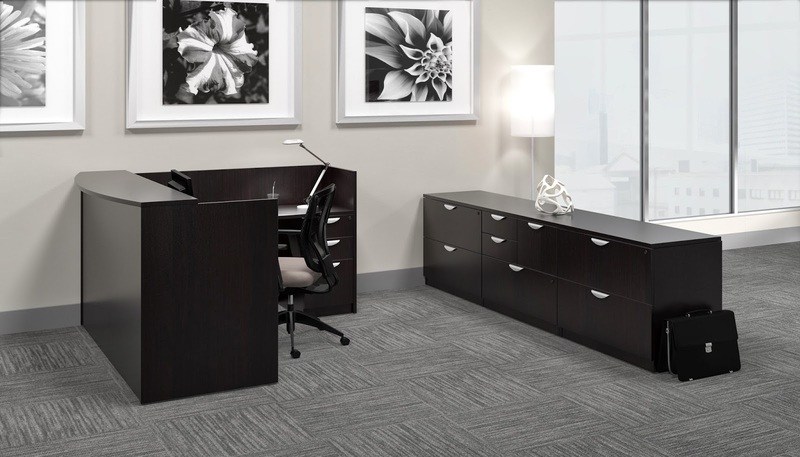 Dark wood tones have become one of the biggest hit trends in interior design, especially for high end executive offices. Especially dark woods like espresso, chocolate, and mocha, not only sound delicious, but they also convey a great sense of elegance. They create a stark yet appealing contrast in rooms with lighter colors, and they match almost anything. In fact, some furniture brands like the look so much they offer whole lines of stylish executive furniture in dark woods. One of the most popular lines has been Verde collection furniture by Cherryman for the office. 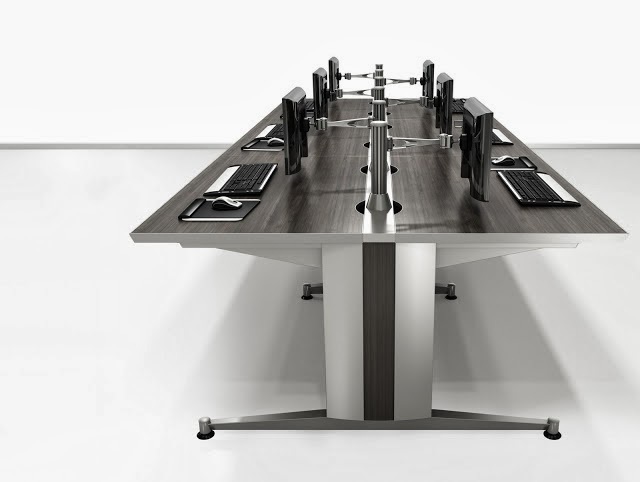 Desks in this line are the epitome of modern executive appeal, offered in both latte and espresso finishes. Whether you go with chrome, aluminum, or powdered steel, nothing compliments dark wood tones better than shining metal. Metal accents always give a strong hint to the modern. The sleek look is futuristic and has been fashion forward ever since the dawn of the computer age, so it's not likely to go anywhere anytime soon. Combined with dark wood accents, chrome creates the perfect blend of past and future. 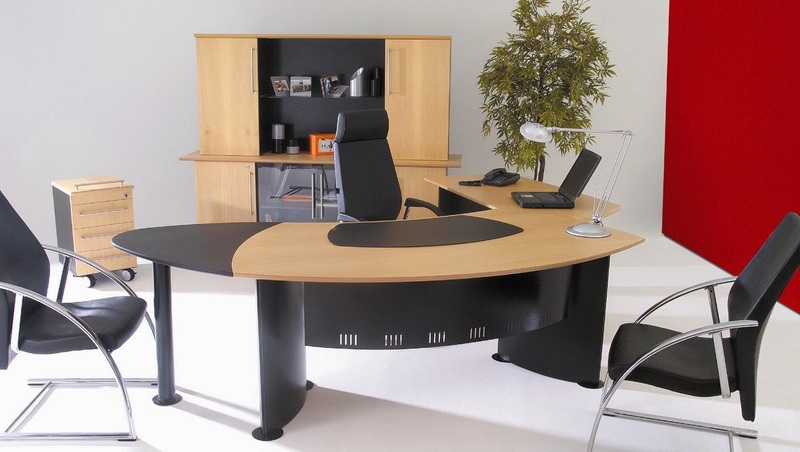 Almost all modern wood desks for executives that rock metal accents can stand their own against any critical eye. In a world that's all about power and progression, it never hurts to have graceful glass to accent an executive office interior. We've got the strong elements like wood and metal, but every executive office should have a touch of elegance. For office designers, glass has always been the great mediator. It offers a light, liquid appearance to soften the overwhelming effect of metal and wood. In smaller offices, glass is especially good at creating the illusion of larger space, and the best part is, it's almost always cheaper. Choosing elegant office desks with glass accents for an executive office will not only enhance your space, it may also save you tons of money! What's the point of being an executive if you don't at least get a big comfy leather chair? All too often people work hard to create the ultimate executive office and then ruin the effect with shabby seating. Office chairs are there, first and foremost, to be comfortable, but they're also supposed to look good. Furnishing your workplace with comfortable executive chairs with leather upholsteries is an important step to an impressive office environment. This season, gray is definitely in. Gorgeous gray chairs like HENDRIX-HB-GR High Back Gray Leather Chair by Woodstock ensure both style and comfort for an affordable price. The last thing a guest is going to be impressed by is clutter, or if he is, it's not a good thing. You may be a wonderful person and business executive, but messy offices are one of the best ways to ruin that professional image. Staying clean and organized improves image, efficiency, and effectiveness in the workplace. In the cold seasons, it also reduces health hazards by limiting the spread of disease. Try to choose clever options for storage like overhead hutches and cabinets that match existing furniture. They will help to keep your place streamlined and looking good! Now that the walls and furniture is all but complete, it's time to decorate! This is the part that both professional and beginning designers tend to enjoy most because it allows them the freedom to design without so many aesthetic rules to limit them. 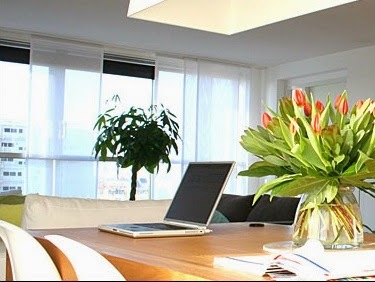 One of the biggest trends in executive office design has been the addition of desk plants to the office. Plants look great and come in all sorts of shapes, sizes, designs, and colors to match just about any office space. Some plants like gardenias, golden pothos, peace lilies, and spider plants, can even act as natural air purifiers by removing harmful VOCs from the air. For a splash of color and liveliness, wall art and even small bowl fish make non-intrusive, entertaining friends to any desk space. Ergonomic study has become the backbone of contemporary office design, and for good reason. In the workplace, smart furniture like discount ergonomic monitor arms for computer use can drastically improve efficiency, productivity, employee health, pain relief, and it can even maximize space. 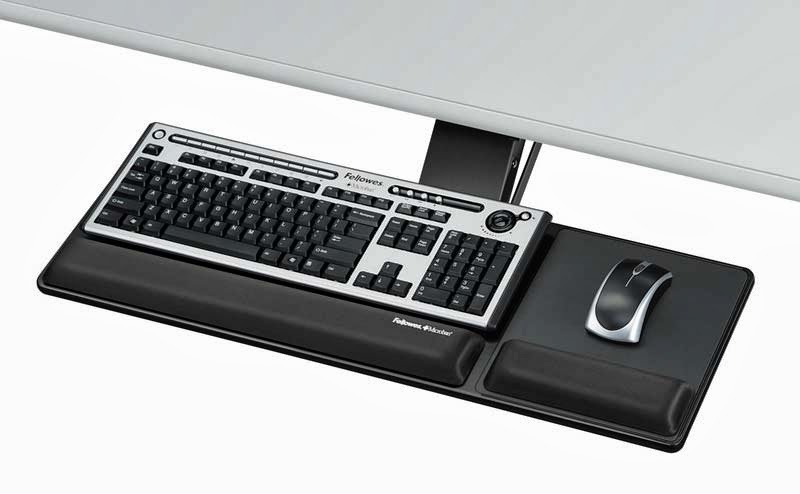 Desks, chairs, and keyboard trays nowadays all offer ergonomic benefits. In an executive office, guests should be a top priority. As a business leader, it's the executive's job to set the best example for how visitors should be treated, and that means providing a comfortable, welcoming place for clients and patrons when they arrive. When decorating, always be sure never to leave out comfortable guest chairs for visitors. The goal should always be to leave them feeling the same executive level comfort as you. 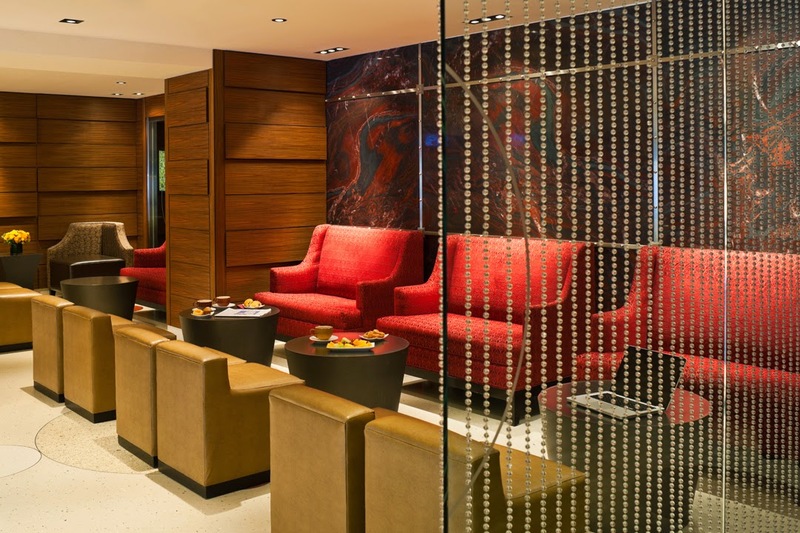 As your guests, they deserve all luxury you can offer them! The office training room is an important business area that was once just an afterthought. In 2014, the training area makeover project is trending in a a major way. Businesses are realizing the potential of these valued areas and are steadily searching for ways to improve training area productivity. In today's article, we'll showcase 7 cool and innovative ways sure to help you do just that. Enjoy! 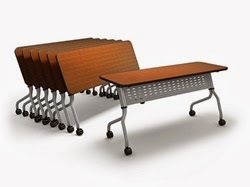 The most popular office training tables of 2014 feature flip top designs that offer excellent benefits in the workplace. A flip top style table allows for easy nesting when not in use and saves valuable floor space. Units like the Mayline SY1872 Sync Table can be quickly transformed with the pull of a lever when needed and are quite user friendly. The ability to easily store folded tables along walls will help you to maximize your square footage and better accommodate your specific training needs on a day to day basis. Like with flip top tables, nesting chairs are another must for those taking on a training room makeover project. Don't limit your business capabilities and take up valuable floor space that can be used for other important furnishings. The use of training room chairs that nest will save you valuable space while enhancing your corporate appeal. Models like the Mayline TSH1 Valore Chair are a top choice of industry professionals and should be considered for any project. While flip top tables and nesting chairs offer excellent modular benefits, there are still several great ways to take your space to the next level. As a rule of thumb, if you can outfit a product with wheels... you should! Top selling tables and chairs for the training room are commonly available with locking casters that prevent unwanted movement when in use, but allow for easy reconfiguring when needed. Modular design characteristics like these will ensure optimal levels of efficiency while making for easy to clean spaces. There's nothing wrong with traditional tones like cherry, maple, and mahogany. However, if you're looking to take your space to the next level and impress your valued guests it's time to think outside the box! 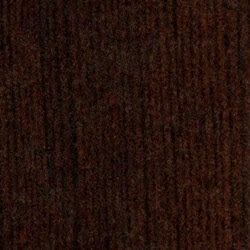 Hot color options that are trending in 2014 include mocha, espresso, and other dark wood tones. This look also shows minimal wear and is sure to look good for years. Key brands like Mayline, Global Total Office, and Cherryman Industries all offer product lines available with the coolest new finish options that will help you set your space apart from the competition. The use of metal in the workplace is a major trend that can be easily incorporated into the training area. This industrial look also ads much desired durability and contemporary flair that will be appreciated by any business. Silver, titanium, and even polished metal finishes are recommended for those in search of cutting edge ways to boost training area appeal. Adding power features in the workplace is just plain smart. 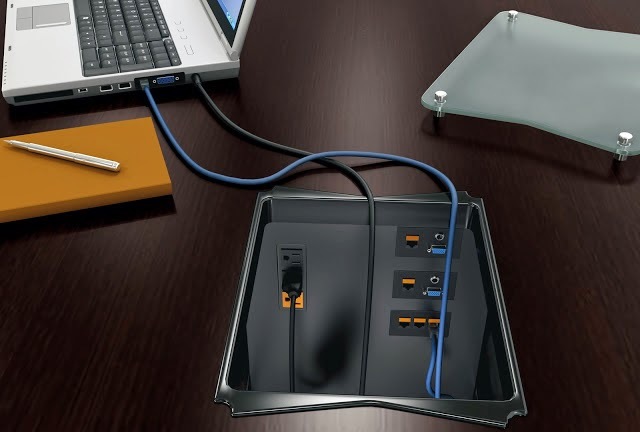 Basic modules are available that feature 3 prong outlets and phone cord ports that won't break your budget. In many cases, tables can be linked together and utilized more effectively in group presentations or learning activities. In addition to powered tables, adding wall mounted TV's and other power features will surely help you to create a next level training environment worthy of praise. These days it's all about ergonomic capabilities. When it comes to the training room there's no difference. The use of ergonomic office products will improve functionality, comfort, and productivity while saving your time in the process. With hundreds of ergonomic office chairs for sale on the market in 2014 you'll be at no shortage of options to meet your specific needs and budget. Additional products like mobile presentation boards, adjustable screen mounts, and multi media accessories are highly recommended by industry professionals. If you want to enhance your appeal and efficiency, you've gotta keep it ergo!